If you're looking for environmentally friendly cleaning supplies that can help you keep your house in order, you'll be excited to find out about the items discussed in this Quickie Green Cleaning product review. Quickie Manufacturing sent one of the members of LoveToKnow Cleaning's editorial team several items in the company's Green Cleaning product line to test. Find out more about the products in this informative independent review! 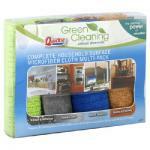 For this product review, I tried three items in the Quickie Green Cleaning line. My experiences with and thoughts about the products are detailed below. 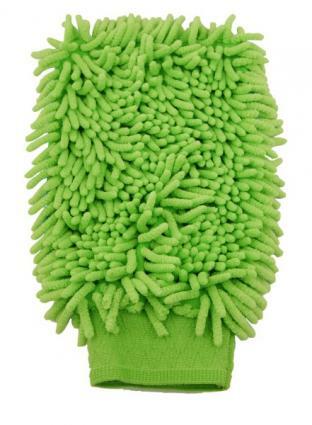 If you're looking for something to make the chore of dusting as easily as it can possibly be, you'll be excited to discover the chenille dusting mitt in Quickie Manufacturing's Green Cleaning product line. I was pleasantly surprised by how simple this product is to use and how well it works. I had never used a dusting mitt before trying this product, so I was actually rather skeptical about how good of a job it would do. However, it only took a few seconds to see the benefits of this particular cleaning product. Working with it proved to be much easier than having to deal with the mess of swishing a damp dusting cloth or dish towel to wipe away dust. I just placed my hand inside the mitt and lightly ran it across surfaces that need to be cleaned. They were free from dust in no time at all, and I didn't even sneeze once while cleaning. This is highly unusual, since I'm violently allergic to dust. I was very happy to see how effectively the product picks up dust without dispersing it into the air. The microfiber chenille surface draws dust to it like a magnet, which is how this product makes it easy to clean surfaces without stirring up allergens into the air. If you have mini blinds in your house, you know just how difficult it is to get them clean. If you've ever tried to wipe them down with a damp cloth, you know that doing so often leaves you with a bigger mess than you had to begin with. Because I've had so many problems keeping mini-blinds clean over the years, I was quite skeptical when I received a Green Cleaning Microfiber Mini Blind Duster to try. However, it quickly became apparent that this product was the answer to the challenges I face keeping the 26 pairs of mini-blinds in my house clean! 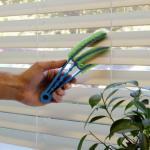 The mini blind duster in Quickie Manufacturing's line of Green Cleaning products is an excellent solution for removing built-up dust from the slats of mini blinds. The concept is similar to that of a feather duster, except rather that it features small, flexible prongs made from microfiber. The cleaning prongs glide smoothly over mini-blind slats, pulling dust away effectively, leaving behind a clean surface. It has a lightweight handle that is easy to grip and maneuver, so it's quite simple to use. If you are tired of going through roll after roll of paper towel to take care of your day-to-day household cleaning needs, you may find that a set or two of Quickie Manufacturing's microfiber cleaning cloths might be exactly what you need. They can be washed and reused over and over, making them an excellent option for keeping your budget under control as well as for reducing waste. Not only are the microfiber cloths in the Green Cleaning line budget and environmentally friendly, they can also help you do a better job of keeping the surfaces in your home clean. Because they are made from microfiber, these cloths can help make short work of many household cleaning tasks. I had positive results using my set of cloths for various tasks, including wiping counters after meal preparation, cleaning the kitchen sink and dusting bookshelves. Each multi-pack of microfiber cleaning cloths comes with four 16 inch by 14 inch cleaning cloths, each of which is designed specifically for a particular type of household cleaning task. There is a cloth made for dusting and polishing tasks, as well as separate cloths made for cleaning kitchen and bathroom areas, stainless steel surfaces and glass and windows. The cloths are labeled, making it easy to tell them apart and select the right item for each cleaning job that needs to be tackled. LoveToKnow Cleaning would like to thank the manufacturer for the opportunity to complete this Quickie Green Cleaning product review and wishes the company continued success in its efforts to introduce and market effective, environmentally friendly household cleaning products.